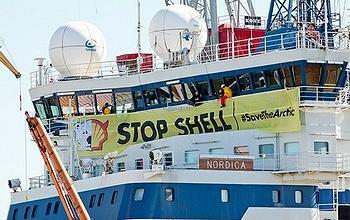 HELSINKI, Finland, May 1, 2012 (ENS) – Greenpeace Nordic activists today boarded and occupied a Shell-contracted icebreaker in Helsinki harbor as it was preparing to leave for the Alaskan Arctic. At 10:30 this morning, 20 activists from 13 different countries boarded the icebreaker Nordica and locked themselves down throughout the ship, from the cabins to the top of the mast. “We are calling on the oil giant Shell to abandon its controversial plans to open up the fragile Arctic for oil drilling,” Greenpeace said today in a statement protesting the first major offshore drilling in the Arctic since the early 1990s. A letter on the Greenpeace website appealing to Shell to refrain from oil expoitation in the Arctic has been signed by 391,958 people to date. “Oil companies know full well that an oil spill off the Alaskan coast would devastate the environment and prove impossible to clean up,” Laakso said. The Nordica is one of two Shell-contracted icebreakers owned by the Finnish government. It is heading to Alaska to join its sister ship, the Fennica, to support the Kulluk and Noble Discoverer, the two drilling vessels en route to the north coast of Alaska to drill five exploratory wells for Shell in the Chukchi and Beaufort Seas later this summer. Shell has said it intends to begin drilling in the two neighboring seas on or about July 10 and continue until just before ice forms this autumn. Shell has proposed drilling up to six wells in the Chukchi Sea during the next two summer open water seasons within the Burger Prospect, located about 70 miles off the coast in about 140 feet of water. The Obama administration on February 17 approved Shell’s oil spill response plan for drilling exploratory wells in the Chukchi Sea. 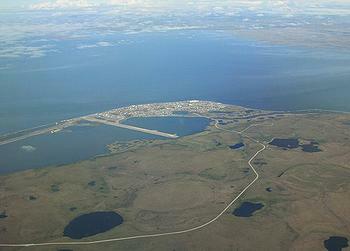 The approval was granted after the U.S. Department of the Interior’s Bureau of Safety and Environmental Enforcement, BSEE, required Shell to prepare for a worst case discharge nearly five times that of their previous plan, to include planning for adverse weather conditions, and to develop special equipment and strategies that could respond to a loss of well control and a spill. Shell has committed to provide for the availability of a capping stack to shut off any flow of oil if other shut-off systems fail; the capability to capture and collect oil from that stack; and access to a rig capable of drilling a relief well that could kill the well, if necessary. On March 28, the BSEE approved Shell’s oil spill response plan for the Beaufort Sea. Shell has spent nearly $4 billion and five years preparing to drill in the Beaufort and Chukchi seas. The company plans to halt drilling operations during the late summer hunt for bowhead whales by native Alaskans. “In the Arctic frontier, cautious exploration – under the strongest oversight, safety requirements, and emergency response plans ever established – can help us expand our understanding of the area and its resources, and support our goal of continuing to increase safe and responsible domestic oil and gas production. We are taking a cautious approach, one that will help inform the wise decisions of tomorrow,” Salazar said. But Greenpeace and its supporters are not satisfied with that assurance. Shell is the first major international oil company to make exploitation of the Arctic a serious corporate focus. If it strikes oil this summer, other global oil giants will quickly follow and spark a dangerous Arctic oil rush, the campaign group warns.